MILLERSBURG, OHIO — (March 5, 2019) – Guggisberg Cheese has claimed the top three spots in the Swiss category at the United States Championship Cheese Contest, along with gold and first place in the Baby Swiss category. This is the 5th consecutive contest where Guggisberg has taken first place in the Swiss category, receiving scores of 99.30, 98.80, and 98.65. Guggisberg’s Baby Swiss claimed the top spot in its category with a score of 99.15. The U.S. contest takes place every-other year, alternating with the World Championship Cheese Contest, and was held March 5th & 6th at Lambeau Field in Green Bay, Wisconsin. It is the largest technical evaluation of cheese, butter, and yogurt in the country, and considered to be one of the most prestigious of dairy competitions. This year’s contest was record-breaking, with 2,555 sub-missions from 35 states. The submissions were split into one of 116 classes, and then scored on a 100-point scale by a panel of professional judges from within the industry. 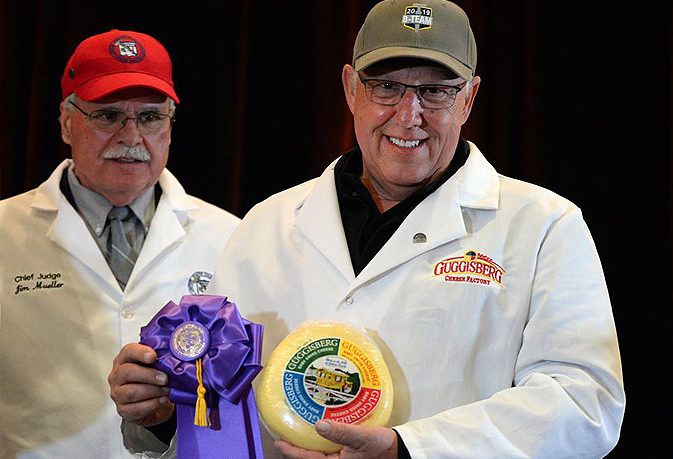 The three highest-scoring cheeses in each category, judged on flavor and body, were awarded trophies.